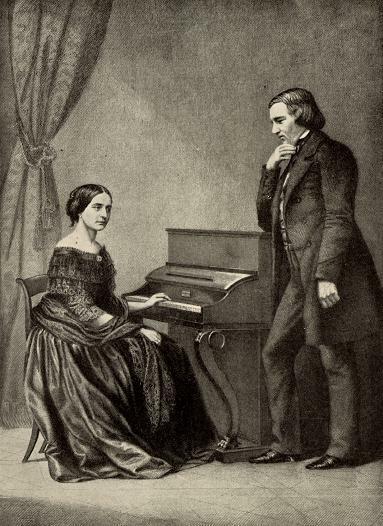 Schumann's parents were not musical but they encouraged his interest in music with Piano lessons from the age of 10. However his family was later to be beset by tragedy. When Schumann was in his teens, his father died and his sister committed suicide in quick succession, events that were to have a deep impact on the young musician. Initially music was to take a back seat in his life. For his main subject he studied law at Leipzig while simultaneously continuing his music studies. One of his music teachers was Friedrich Wieck whose daughter Clara showed a great talent at the piano while she was only 9 years old. 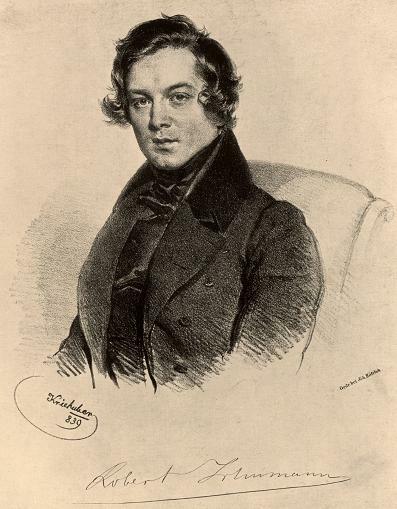 A further tragedy was to hit Schumann when a mishap damaged one of his hands and spoiled his chances as a pianist. Some accounts blame a device he used to strengthen his fingers, but other theories suggest mercury poisoning as a side effect of his syphilis treatment. After the accident, Schumann was to concentrate more on composing. Schumann maintained his association with the Wiecks and when Clara was of the right age, he sought to marry her but her father forbade it. Following a legal action, Schumann was able to marry her shortly before her 21st birthday. Although Clara was extremely talented in her own right as both pianist and composer, her career became secondary to that of her husband's and there are suggestions that Robert's jealousy was a factor in constraining her career. Nevertheless as well as bringing up three children Clara played a significant role in classical music, through her expert advice and encouragement to other composers including Brahms for example. Although Schumann composed much worthwhile music, he suffered from mental illness with periods of self-doubt and suicidal depression. Following a suicide attempt he was committed to an asylum where he was to die two years later suffering from the later stages of symphilis. 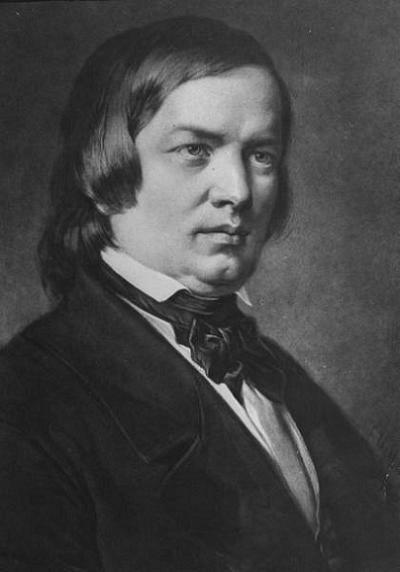 Robert Schumann was a composer firmly of the Romantic period, often adopting a free "poetic" style for his works. They have a structure and logic, yet represent an expressive "stream of consciousness" rather than being bound by Classical views of form. During his brief career, he worked as a piano professor at the Leipzig Conservatory under Mendelssohn and also later as a conductor. Starting much later than some other composers, he was in his thirties before he started to compose larger concert works, but he completed four symphonies, a well-known piano concerto, some chamber works, songs and song cycles and a wealth of shorter works for piano. 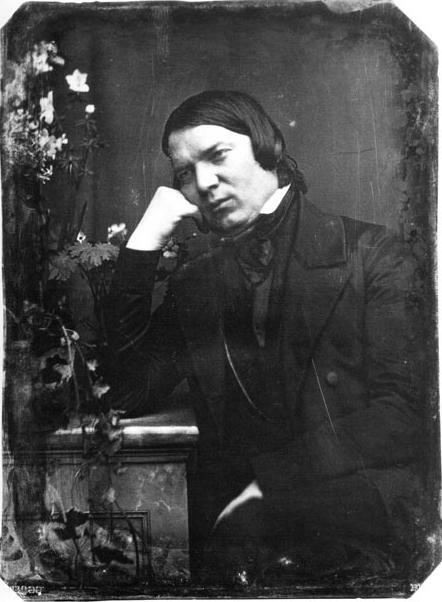 Schumann had a great interest in literature, philosophy and the arts. He was also accomplished in journalistic circles as a music critic, and in that capacity he recognised and promoted the talents of Chopin, Brahms and Berlioz. Schumann's Piano Quintet is highly recommended for the breadth and complexity of its emotions. It was also ground-breaking as the first important work of this kind by a major composer. The instrumentation consists of a normal String Quartet (2 violins, viola and cello) plus a piano. Schubert's earlier Trout Quintet was for a different combination of instruments which included the double bass. Several later composers were to follow Schumann's lead including Brahms, Dvorak, Fauré, Elgar and Shostakovich. 4 Symphonies - including No.1 "Spring" and No.3 "Rhenish"
For further listening, Cary Chow's album Zirkus consisting of the solo piano works Carnaval and Kreisleriana, is an excellent place to start. To date, we have chosen to represent the works of Robert Schumann within the mfiles catalogue by reference to his simpler piano works for children. These well-loved pieces have been in the repertoire of the student pianist for many years and no doubt will continue to be so.